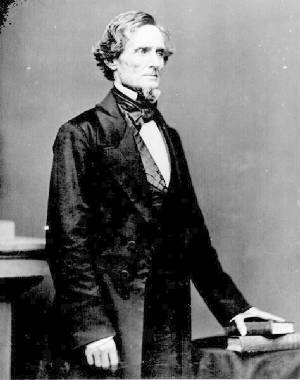 American Civil War (1861–1865) was a major war between the United States ("Union") and eleven Southern states ("Confederacy"), which declared that they had a right to secession and formed the Confederate States of America, led by President Jefferson Davis. The Union included free states and Border States and was led by President Abraham Lincoln and the Republican Party. Although the Border States were under Union control, they supplied the South with tens-of-thousands of troops. Although the South strongly believed in States' Rights (Bill of Rights and the 10th Amendment) according to the United States Constitution and believed that it entitled them to a right of secession, the Republicans rejected any right of Southern secession and also opposed the expansion of slavery into territories owned by the United States. Soldiers' motives for fighting in the conflict varied, as well as the causes and origins of the American Civil War. 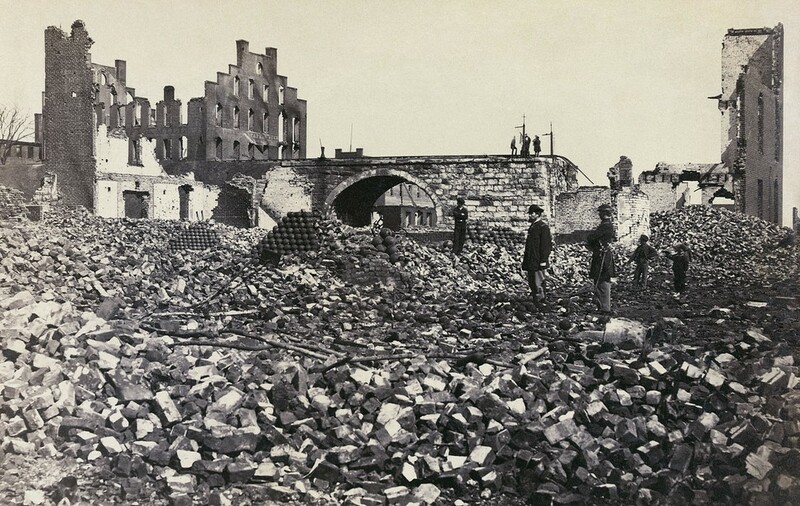 The Civil War left many Southern cities in ruins. Richmond from Ruins, Rubble, Reconstruction, to Rebuilding. ca. April 1865. Fighting commenced on April 12, 1861, when Confederate forces attacked a United States (Federal) military installation at Fort Sumter in South Carolina, the first state to secede. South Carolina, however, claimed that Fort Sumter was legally within its (territorial) waters. During the American Civil War, the North generally named a battle after the closest river, stream or creek, and the South tended to name battles after towns or railroad junctions. Hence the Confederate name Manassas after Manassas Junction, and the Union name Bull Run for the stream Bull Run. During the first year of the Civil War, the Union assumed control of the Border States and established a naval blockade as both sides raised large armies. In 1862, major bloody battles, such as Shiloh and Antietam, were fought causing massive casualties unprecedented in U.S. military history. 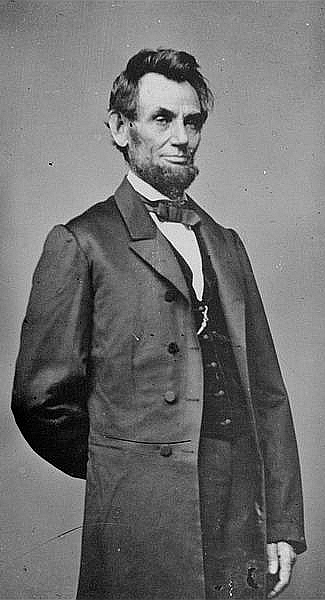 In September 1862, Lincoln's Emancipation Proclamation made the freeing of slaves in the South a war goal, despite opposition from Northern Copperheads who tolerated secession and slavery. Emancipation reduced the likelihood of intervention from Britain and France on behalf of the Confederacy. In addition, the goal also allowed the Union to recruit African Americans for reinforcements, a resource that the Confederacy did not exploit until it was too late. The Border States and War Democrats initially opposed emancipation, but gradually accepted it as part of total war needed to save the Union. European immigrants joined the Union Army in large numbers too. 23.4% of all Union soldiers were German-Americans; about 216,000 were born in Germany. 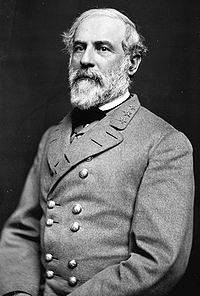 In the East, Confederate General Robert E. Lee assumed command of the Army of Northern Virginia and experienced a series of victories against the Army of the Potomac. However, Lee's best general, Thomas Jonathan "Stonewall" Jackson, was killed at the Battle of Chancellorsville in May 1863. Lee's invasion of the North was repulsed at the Battle of Gettysburg in Pennsylvania in July 1863; Lee, however, managed an orderly retreat to Virginia. The Union Navy captured the port of New Orleans in 1862, and Ulysses S. Grant seized control of the Mississippi River by capturing Vicksburg, Mississippi, in July 1863, thus splitting the Confederacy. See also: Anaconda Plan: The United States Naval Plan of Divide and Conquer and Turning Points of the American Civil War. By 1864, long-term Union advantages in geography, manpower, industry, finance, political organization and transportation were overwhelming the Confederacy. Grant fought a number of bloody battles with Lee in Virginia during the summer of 1864. 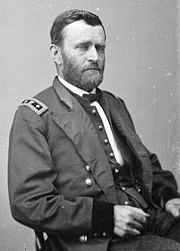 Lee's defensive tactics resulted in extremely high casualties for Grant's army, but Lee lost strategically overall as he could not replace his casualties and was forced to retreat into trenches around the Confederacy's capital, Richmond, Virginia. Meanwhile, General William Sherman, the leader of the Union Military Division of the Mississippi, captured Atlanta, Georgia, during his March to the Sea. Sherman also destroyed a hundred-mile-wide swath of Georgia. 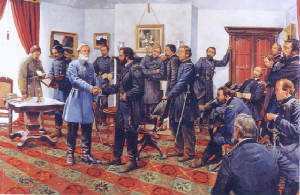 In 1865 the Confederacy collapsed after Lee surrendered to Grant at Appomattox Court House. See also Order of Surrendering Confederate Forces and Last Battle and Final Surrender of the Civil War. During the American Civil War, all slaves in the Confederacy were freed by the Emancipation Proclamation, which stipulated that slaves in Confederate-held areas, but not in Border States or in Washington, D.C., were free. Slaves in the Border States and Union-controlled areas in the South were freed by state action or by the Thirteenth Amendment, although slavery effectively ended in the United States in the spring of 1865. The full restoration of the Union was the work of a highly contentious postwar and aftermath era known as Reconstruction. More than 10,500 battles and skirmishes were fought during the Civil War, with 384 engagements (3.7 percent) identified as the principal battles and classified according to their historical significance. Napoleonic Tactics and diseases, consequently, were the contributing factors for the high casualties during the conflict. The American Civil War produced an estimated 1,030,000 casualties (3% of the U.S. population, which today would equate to nearly 9,000,000 souls), including approximately 620,000 deaths (two-thirds by disease). Let's take a moment and think about it on today's terms. 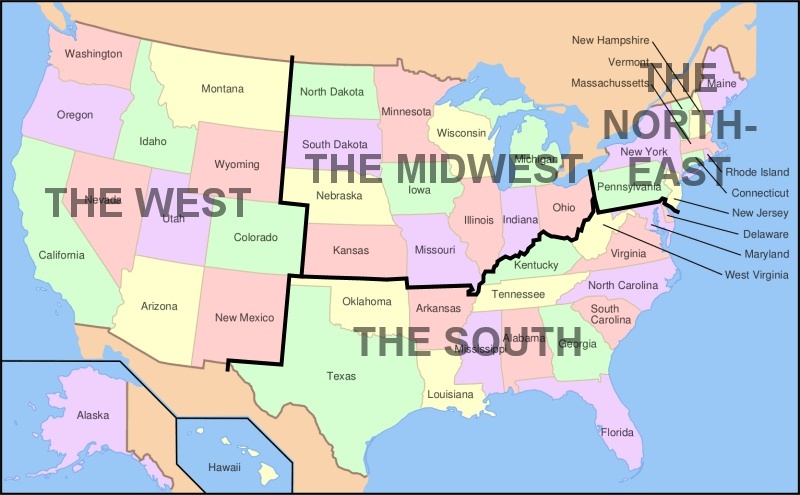 Placing it into perspective, 3% of the U.S. population equates to the combined population of the present-day states of New Hampshire, Hawaii, Rhode Island, Montana, Delaware, South Dakota, Alaska, North Dakota, Vermont and Wyoming. See also American Civil War History. 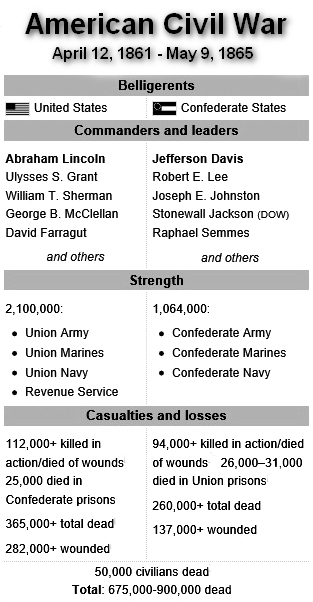 The Civil War accounted for more casualties than all previous U.S. wars combined. Presently, the causes of the war, the reasons for its outcome, and even the name of the war itself are subjects of lingering controversy. The main result of the war was the restoration of the Union. Also, approximately 4 million slaves were freed in 1865. Based on 1860 United States census figures, 8% of all white males aged 13 to 43 died in the war, including 6% in the North and an extraordinary 18% in the South. See also: American Civil War Battles, Casualties, & Statistics and Organization of Union and Confederate Armies. Present-day US Census Bureau Map reflecting the regions of the nation. 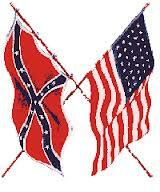 During the Civil War, the differences in regions, known as sectionalism, was a major cause of the Civil War. See also American Civil War History of Each State and American Civil War: A Short History. Try our search engine, enter, for example, General Lee, Civil War Aftermath, Causes of the Civil War, Battle of Gettysburg, etc. Recommended Viewing: Ken Burns Award Winning Series, "The Civil War"
Recommended Reading: The History Buff's Guide to the Civil War (400 pages). • Antebellum: Investigates the critical years before the war, in particular the growing crises, extremists, and slavery. • Politics: Contrasts the respective presidents and constitutions of the Union and Confederacy, the most prominent politicians, and the most volatile issues of the times. • Military Life: Offers insights into the world of the common soldiers, how they fought, what they ate, how they were organized, what they saw, how they lived, and how they died. • The Home Front: Looks at the fastest growing field in Civil War research, including immigration, societal changes, hardships and shortages, dissent, and violence far from the firing lines. • In Retrospect: Ranks the heroes and heroines, greatest victories and failures, firsts and worsts. • Pursuing the War: Summarizes Civil War study today, including films, battlefield sites, books, genealogy, re-enactments, restoration, preservation, and other ventures. From the antebellum years to Appomattox and beyond, The History Buff’s Guide to the Civil War is a quick and compelling guide to one of the most complex and critical eras in American history. Recommended Reading: Ordeal By Fire: The Civil War and Reconstruction (816 pages). Editor's Choice: The Civil War Battlefield Guide: The Definitive Guide, Completely Revised, with New Maps and More Than 300 Additional Battles (Second Edition) (Hardcover). Description: This new edition of the definitive guide to Civil War battlefields is really a completely new book. While the first edition covered 60 major battlefields, from Fort Sumter to Appomattox, the second covers all of the 384 designated as the "principal battlefields" in the American Civil War Sites Advisory Commission Report. As in the first edition, the essays are authoritative and concise, written by such leading Civil War historians as James M. McPherson, Stephen W. Sears, Edwin C. Bearss, James I. Robinson, Jr., and Gary W. Gallager. The second edition also features 83 new four-color maps covering the most important battles. The Civil War Battlefield Guide is an essential reference for anyone interested in the Civil War. "Reading this book is like being at the bloodiest battles of the war..."